Comes with a display that can clearly indicate the status and data, suitable for home, industrial, commercial etc. Large-screen LED display, adjustable charge and discharge parameters, light control + timing off. 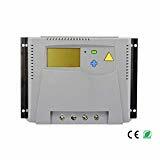 Built-in overcurrent/short circuit protection, open circuit protection, reverse connection protection, without damaging the controller. Connect the positive and negative terminals of the battery to the controller, and the controller will automatically detect the battery voltage(48V). Scope of application: Solar power systems, outdoor power systems, solar lights, solar powered appliances, small projects, etc. 1 The controller is automatically adapted to 12V/24V. When installing for the first time, please make sure that the battery has enough voltage so that the controller can recognize the correct battery type. 2 Install the controller as close as possible to the battery to avoid voltage drop caused by excessive length of the wire, which will affect the normal voltage judgment. 3 This controller is only suitable for all kinds of lead-acid lithium batteries (including openings, seals, gels, etc. ), please do not use other batteries (including nickel-metal hydride batteries, etc.). 4 This controller can only use the photovoltaic panel as the charging source. Do not use DC or other power sources as the charging source. 5 The controller will heat up when it is running. Please pay attention to the controller on a flat, well-ventilated surface.